A Round Table on Labels. Entry-, Mid-, and High-Volume Digital Label Solutions. The latest advancements in digital label printing target flexible packaging, ink formulation, and hybrid capabilities. Today’s dedicated label printers are segmented by target run length—entry, mid, and high. Each segment offers its own benefits with varying price points and speeds. According to the 2018 Color Digital Label Printer market forecast from Keypoint Intelligence, production-level color digital label printers based on electrophotography (EP) accounted for $57.4 million in sales in North America in 2017. Keypoint Intelligence forecasts that EP printer total will grow to $73.3 million in 2022, a compound annual growth rate (CAGR) of five percent. In 2017, Keypoint Intelligence estimates that color digital label printers accounted for $48.2 million in sales in our region, a tally that it forecasts will grow to $74.5 million in 2022, a nine percent CAGR. Note, Keypoint Intelligence defines production-level devices as dedicated digital webs designed to print labels for 24/7 production, and capable of an average monthly print volume of one million labels or more; this definition does not include tabletop label printers. “Growth rates for sales in dollars will look modest, but growth is persistent for both the major technology categories. 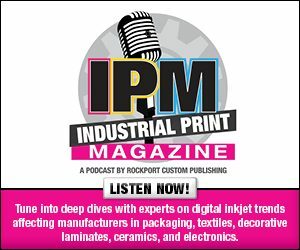 Both EP and inkjet technology continue to develop and add new capabilities and options,” says Bob Leahey, associate director, Keypoint Intelligence. Growth rates were higher years ago, he adds, but says that the North American market for production-level equipment is now fairly penetrated, with a good share of sales going to companies that are replacing older units. The installed base for digital label printers in North America is roughly 60/40 EP to inkjet according to Keypoint Intelligence. While both technology types are growing, Leahey says inkjet exhibits more growth, partly due to its wider product range, and partly due to its comparative youth—inkjet has been in the market for about ten years, while EP has been there for double that time. Above: Wine bottle labels produced with HP Indigo digital presses. Digital label systems evolve to satisfy a number of markets, applications, and label converters. The latest advancements target flexible packaging, varying toner temperatures, and hybrids. In EP systems, emerging new toners are available in formulations that require both higher and lower fusing temperatures. Sebastien Stabel, sales manager, carton packaging, EMEA, Xeikon, says these formulations are designed to be compliant with today’s regulations as well as emerging regulations. Like dedicated label printers, hybrid presses—which combine flexography and digital in one line—are also gaining popularity for flexibility. “Printers are looking at how they can get the production and most diverse work out of their equipment,” says Tim Fox, president, MPS North America. In the past, printers used digital and then moved offline to finish converting and embellishments—forcing printers to purchase two different types of equipment, often from two different vendors. Additional advancements in digital label systems include higher resolutions for inkjet, speeds of more than 197 feet per minute (fpm), blank reel to fully finish products, and white capabilities, says James Thomas, business development and marketing manager, Focus Label Machinery Ltd.
We classify entry-level dedicated label solutions as systems that run less than 1,000 square feet per run. Low-volume solutions are geared towards food and beverage industries as well as other markets prone to short runs, including nutraceutical, corrugated boxes, and visitor badges. Label converters that want to bring short-run, full-color label production in house often select an entry-level solution. These companies typically outsource or turn away short-run work because they cannot cost-effectively produce it in house, says Katelyn Bohr, director of marketing, Colordyne Technologies. Brand and private label owners that want to save time and money in the production process also use an entry-level solution to bring label printing in house. “Brand owners improve turnaround times, marketing capabilities, and manufacturing workflow by running label production on demand. Printing what they need, when they need it,” comments Bohr. It also saves money by eliminating minimum order quantities and wasted label inventory. Depending on seasonal or geographical conditions, product cycles are shortening, which requires label presses that efficiently produce small runs for an acceptable price, says Matthias Marx, head of marketing, business unit label, Gallus Group. This increases popularity for ultra-short runs of less than 500 square feet—ideal for entry-level presses. Mark Strobel, VP of sales and marketing, Primera, suggests entry-level label systems are ideal for small businesses with short-run printing or start-ups who want to test market different label options. Entry-level system price points range from lower costs of $1,295 to $205,000. Speed also varies with some devices operating up to 60 fpm. Customers often seek features like affordability, ease of use, embellishments, and nearline finishing. Embellishments are attractive for most entry-level label devices because the systems primarily cater to short runs—putting more emphasis on exceptional quality. Embellishments include different types of lamination, cold and hot foils, overcoats, printing both web sides, die cutting in all forms, and the ability to run all material types such as paper, film, foil, and board, says Fox. According to Doucette, finishing is also important because clients are looking for applicator-ready formulated roll labels. Some systems offer optional nearline devices for slitting, matrix removal, and lamination. Mid-level dedicated label devices operate anywhere from 1,001 to 20,000 square feet per run. With more operating power than an entry-level device, these solutions target label converters, flexible packaging manufacturers, and private label manufacturers with a large number of SKUs, but low production volumes per version. “These companies need to be able to run medium label volumes and require variable data or versioning that would be inefficient and costly for traditional printing methods,” offers Bohr. Like entry-level customers, mid-level buyers also invest in digital labeling to provide short runs, faster turnaround, and greater branding variability. With a mid-level solution, outsourcing to commercial label printers and storing large label quantities is eliminated—resulting in no inventory spoilage or additional setup or plate costs, says Stephanie Hopkins, director of sales, iSys—The Imaging Systems Group, Inc. “Users can efficiently print as few as 20 labels or as many as they can fit on a roll in minutes rather than hours, eliminating lengthy lead times,” she offers. These devices typically have low acquisition costs compared to high-level devices, which simplifies entry into digital label printing. “They have flexographic and offset printers already and a large investment in high-run digital machines can exceed their budget, so they can use mid-run digital solutions selectively,” explains Juan Kim, CEO, VALLOY Incorporation. In addition to labels, converters in this range often produce matrix-removed easy-peel stickers, tags, and flexible soft packaging. Additional applications include product labels for coffee, wine, bakery, confectionary, meat, cheese, and other specialty and gourmet foods. Speed is important for label converters and manufacturers in the mid-level space to increase or maintain their throughput. Mid-level print speeds range from 20 to 185 square fpm with price points from $3,995 to $499,000. Supporting tools for mid-level label solutions target inline finishing such as lamination, rotary or laser die cutting, and slitting capabilities. For example, some digital print engines can be mounted on top of flexographic presses or web handling systems. “The press is then able to produce digital work with the inline finishing and decorating assets already on the flexographic press,” says Bohr. The modular design provides greater flexibility and incorporates the exact finishing assets customers need and have invested in. Workflow automation and RIPs are also offered. Mike Pruitt, product manager, Epson America, says these tools provide customers with a fully customizable solution designed to streamline orders, minimize production errors, increase productivity, and run production effectively. High-end dedicated label solutions operate at 20,001 to over 200,000 square feet per run. These devices are often used by mid to large brands for a range of applications from shrink packaging and retail labels to industrial uses. “From Aunt Sallie’s Mustard to the large CPG brands, from high-end one-of-a-kind luxury items to mass-produced durable goods, every product needs a label of some kind,” comments Mark Schlimme, VP of marketing, Screen Americas. Because of digital’s broad use, he believes it’s less important to discuss target market or application and more important to focus on business requirements that drive decisions—time to market, just-in-time fulfillment, regional versioning, licensing and security, and mass customization. “National brands with household name products may conceive of a project that can be fulfilled by an entry-level dedicated label solution and some highly local niche market business may need a product label and quantity best produced on a high-level dedicated label solution,” offers Schlimme. Pruitt agrees and says mid to large brands seeking high-end dedicated label solutions also look for quality, reliability, automation, and competitive total cost of ownership. Used by a variety of markets and applications, high-level label devices are typically priced from $699,000 to $1 million. Customers purchasing these devices often look for ease of use and consistency. The print landscape is slowly modernizing and with this, the need for easy-to-use systems. For example, Schlimme says flexographic operators were once crafts people but the labor market for those employees is quickly shrinking. To adapt, buyers should evaluate digital production technology with the operator level in mind. Many high-end label customers seek devices with inline finishing to streamline laminating, die cutting, sheeting, digital embellishing, and spot varnishes. Most devices are capable of on site upgrades for additional modules. Olaf Walter, president, mPrint llc, says this is important so customers can grow the machine with the business without buying new equipment.